Girly utilitarianism was one of the biggest trends we noticed on the spring/summer 2010 runways. Think floral tops and jeweled bags with slim cargo pants and gladiators. (Pre-edit, that read "a gladiator." So you can also go ahead and style yourself with a beefy man in a skirt as an accessory, but I don't think anyone will notice your outfit.) I've always hated trends that lean toward the spare and sleek as they're hard to copy with trickle down fashion. If the point of the piece is the cut, you can't just pickup a pair of Land's End cargos and get the same effect. If you're interested in trying this trend, we're loving the Heratige washed silk crops from Banana Republic ($86.50). They have a trim line whereas other cargos create extra bulk around the thighs (and not the cool, exaggerated kind either). The pockets and roll make them casual, but they're tailored enough for a night out or even work. Prefer bows to buttons? 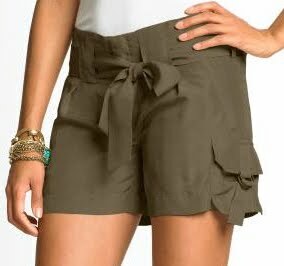 Banana Republic offers a girlier version of the silk crop in the bag-waist short ($69.50). Both versions are available in cream or moss. Don't they wrinkle like crazy? They do, which is why I like a casual style of silk pant. They're a dream for hot weather though. Silk Cargo pants are nice, and so are juicy couture cargo pants.